Where Can I Find CFOT Exam Questions? Can I Find CFOT Exam Questions Online? From time to time, I notice people searching the website for any CFOT exam questions. I suppose they are trying to get some sort of advantage as they study for the CFOT exam. My advice is to stop looking online and start studying the textbook because you will not find these exam questions anywhere online. If you did find them online, then either you found a pile of bogus questions or you found someone who desperately wants to be ejected from the Fiber Optic Association. 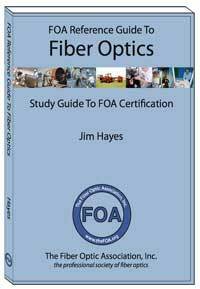 You see, the Fiber Optic Association owns the course curriculum which includes the exam naturally. They wrote it. It’s their IP and so we cannot do whatever we like with it. During the process of becoming an approved FOA training facility, you have to agree to protect the FOA’s intellectual property. When you break that agreement then you can expect to be taken off the approved list. Purchase the CFOT textbook and then read it. The CFOT textbook has a series of questions at the end of each chapter. When you combine all of the questions in the textbook you will have the closest example of a CFOT exam that you can get. Alternatively, if you are interested in challenging your present fiber optic knowledge, I could put together a series of quizzes and post them online. Would you be interested in taking my online fiber optic quiz?